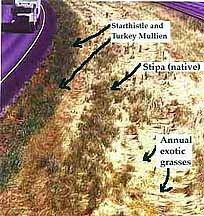 Evaluation of a Native Planting -- What is the break-even ratio? What is the BREAK-EVEN RATIO between native plants and exotics? THIS IS AN EXERCISE using a hypothetical planting of native grasses in an unirrigated median in California, and what the results might be five years later. For the purpose of this exercise the result is 5% cover of the perennial native grasses, 2% native Turkey Mullien, and 93% exotics. What is the ratio of natives vs. exotics that you want to see six months after all artificial inputs (irrigation, spraying, fertilizing, mowing, burning, etc.) have stopped? There is an BREAK-EVEN RATIO of the cover of native plants vs the exotics --- above which you would have an excellent chance of establishing a self-sustaining native planting --- and below that ratio, you would end up with a big weed patch that would require replanting. 1.) WHAT IS THE BREAK-EVEN RATIO OF NATIVES TO EXOTICS? 2.) IF YOU CONTINUED WITH ARTIFICIAL INPUTS like mowing, how low could the ratios go and still maintain a stable native plant area?